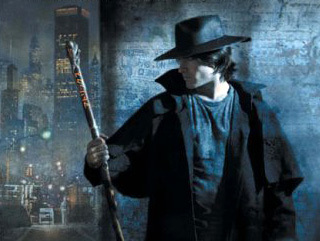 A few years ago the SyFy channel ran a one-season series based on Jim Butcher’s book series about the private investigator/wizard Harry Dresden. It was OK. I saw a couple of episodes, but didn’t know at the time that it was based on a book series. I just discovered that this summer. I’ve read all the books in the series except the last one, “Changes,” and I’m about halfway through that. I’ve read about half of them and listened to the other half as audiobooks. All the audiobooks are read by James Marsters, who played Spike in the Buffyverse. He’s truly excellent, especially with the accents. The first book is a bit tough to get through in audio, because Marsters plays Harry as a bit more of the hard-bitten detective type and there’s a lot of heavy breath on the recording. Gradually he lightens him up a bit as Butcher finds Harry’s voice in the next few novels and by the last one it’s a beautiful merging of words and actor. I’m not a fan of wizard-type fantasy novels. This grabbed me because of the real-world connection. Harry is a free-lance wizard. He’s in the Yellow Pages. (He’s not on the internet because wizards have a bad effect on technology of any kind, especially post-World War II higher tech.) He lives in Chicago, has a little office downtown, and lives in a basement apartment in a converted boarding house. The books are published by Roc, but Baen could have published them. This is “magic with rivets,” as Larry Niven would say. There is a lot of internal consistency to the magic, and limitations to powers. There is a complex political balance between various species of vampires, the White Court of wizards, the faeries of the Nevernever, and even a Chicago mobster who eventually gets some street cred with the magical folk. Harry has friends who are fairys of the smaller sort, werewolves, a couple of half-changed vampires, the Knights of the Sword…oh, and a tiny-but-tough second-generation Chicago cop named Karin Murphy. It’s a wonderful blend of reality and fantasy, a wonderful blend of humor and darkness, and some really bad jokes. After the twelve novels, there are some short stories, some of the novels converted to graphic novels, and even an RPG, like Harry and his werewolf buddies like to play. Butcher is now writing some sword-and-sorcery novels, but I don’t think he closed the door on the Dresdenverse. Even if he did, it’s a very interesting series and I highly recommend it. I got a set of bluetooth headphones for my iPhone (Mototola S305s, $ 40 at Amazon) and I listen to the audiobooks on there. Wonderful! Addition the next day: Harry says, “I don’t do hats.” Heh. And I didn’t make it clear – if you read the first few books, you’re going to really dislike the TV series. While it’s more related to the books than, say, “Bones,” in several cases a main plot of a book is condensed into a single-episode plotline. It trivializes such a plot an awful lot. Oh, and Murphy doesn’t look like Murphy. Leave it to SyFy to trivialize things by not understanding them. You are currently browsing the The Old Gray Cat blog archives for the day Thursday, October 28th, 2010.